When it comes to pomp and circumstance, there really is no competition for the Academy Awards. As hard as the SAGs and the Critics' Choice Awards try to emulate the granddaddy of all award shows, their programs generally suffer from being overly earnest. That's why we're thankful for the mysterious troublemakers who make up the Hollywood Foreign Press Association, as they long-ago decided that their show would be the Fun Bobby of the awards season. Get film and television's best and brightest dressed up, get a little booze in their systems, and then sit back and watch the drama unfold. To get you in spirit, Vulture is happy to present this list of ten things you should keep your eye out for during Sunday night's broadcast. Enjoy! 1. The Open Bar: Much like Bunim/Murray's genius decision to put a hot tub in every Real World house, the open bar is basically the raison d'tre for the Golden Globes. Not only did it inspire Christine Lahti to nearly miss her Best Actress win at the '98 Globes, the bartenders' tendency to over serve Hollywood's secret lushes always adds an element of intrigue to the evening's proceedings. So who's most likely to get hammered this year and say/do something off-color? Our money's on serial mooner Josh Brolin. 2. The Heath Ledger Posthumous Oscar Watch: This is what most people will be watching for. Barring a last-minute surge for Tom Cruise (hilariously nominated in the same category for his Tropic Thunder cameo), Heath Ledger will definitely win for Best Supporting Actor -- but who will accept for him? Christopher Nolan again? Could he be a little more tearful this time? 3. Jeremy Piven, Mercury Rising: The red carpet will probably give the recently maligned sashimi addict his first chance to publicly address his abrupt departure from Speed-the-Plow. Additionally, the Emmy winner could very well be picking up his second Golden Globe for his work on Entourage. A word of advice for Piven? Put some Kleenex in your pocket before you go on stage. You know, just in case. 4. Anne Hathaway Surprise! : Was yesterday's premature announcement that Hathaway would win the Globe for Best Actress in a Drama just a Website glitch? Or a real giveaway? If she wins as planned, will she feign surprise? Will she thank Vulture for tipping her off so she could polish her acceptance speech? Will she work to prepare a speech that doesn't result in evil glares from Angelina Jolie (like at last night's Critic's Choice Awards)? Questions abound! 5. Sean Penn vs. Mickey Rourke, Round Two: Last night's Critic's Choice Awards was the first time the two had been spotted in public since Rourke allegedly bashed Penn's work in Milk by way of an unsavory text message. Penn got the first, but maybe not the last, laugh when he beat out Rourke for Best Actor. During his acceptance speech, Penn even managed to get in a minor sideswipe at Rourke when he stated, "At heart this is a beauty contest, so I had an advantage." All of which points to Sunday being an interesting night between these two old rivals, especially if Penn shows up with Lindsay Lohan on his arm. 6. Mad Men: We haven't seen Don Draper and the cast of Vulture's favorite show since the season-two finale in October. What have they been up to during the off-season? Has anyone put on a bunch of weight or grown weird facial hair? Can Christina Hendricks possibly put more cleavage on display than she did at the Emmys? Since Mad Men is up for Best TV Drama Series, we're guessing most of the cast will presumably be seated in the audience. 7. Best Supporting Actress: Believe it or not, some of Sunday's awards are actually important. Just kidding! Only this one has any real-life implications for the Oscar race. In one of the few still-undecided categories, Pen&eacute;lope Cruz is the current front-runner, but a win for Viola Davis, Rosemarie DeWitt, or Kate Winslet could shake things up. 8. Rumer Willis Gets Her Moment to Shine: Demi and Bruce's eldest offspring was all set to strut her stuff on stage as Miss Golden Globes (heh heh) last year. That is, until those "mean, ugly" writers cancelled Vulture hero Ben Silverman's big party. But the benevolent producers invited her back this year, providing her with the golden opportunity to gently remind bigger movie stars which way they should be exiting the stage. Last year the Golden Globes were canceled due to the writer's strike, but this year the Globes are back, and that means the return of glam on the red carpet. 9. Star Trek Chemistry Check: Chris Pine and Zachary Quinto, aka Kirk and Spock, are set to make their first public appearance together since filming J.J. Abrams's Star Trek. We'll be interested to see if the duo can inject life into the typically stilted dialogue that Globes writers usually pen. Fingers crossed they tell a joke about the ineptitude of Romulans! 10. 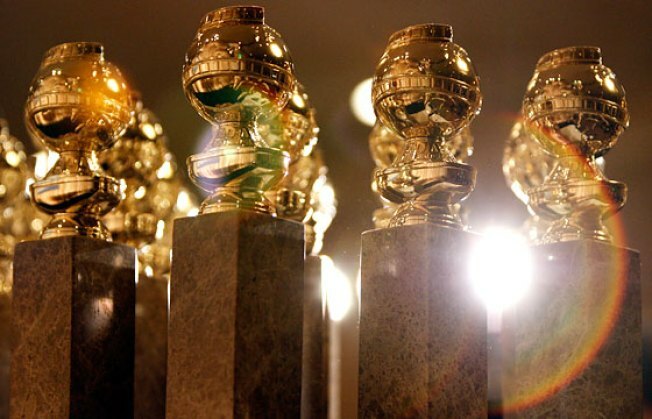 New Globes: This Sunday sees the debut of all-new, redesigned Golden Globe statues. Will the weight differential cause a winner to drop one? Will an award spontaneously burst into flames? All signs point to yes. Who, Besides Anne Hathaway, Will Win a Golden Globe This Weekend? Is The Hurt Locker Primed to Be a Box-Office Breakthrough?